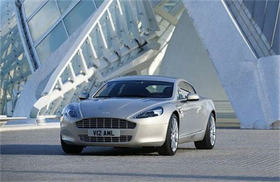 The Rapide, pictured, signals a new direction for Aston Martin and could lead to profits and long-term stability. The first Aston Martin Rapide left the factory on Friday amid considerable fanfare, and the sedan will soon begin arriving in 125 showrooms in 34 countries. This culminates the long road to production that began in concept form at the 2006 Detroit auto show. The production car was shown at the Frankfurt auto show in 2009. Power comes from a hand-built 6.0-liter V-12 making 470 hp. The four-door Aston Martin generated a bit of controversy, but like the Panamera for Porsche, the Rapide signals a new direction for the company and could lead to profits and long-term stability. The Rapide was quickly approved by Dave Richards and his new ownership group after they bought the company from Ford Motor Co. in 2007. The car is built for Aston Martin by Magna Steyr in Austria. In the UK, prices start at 139,950 pounds (nearly $207,500). TheU.S. base price is $199,950.